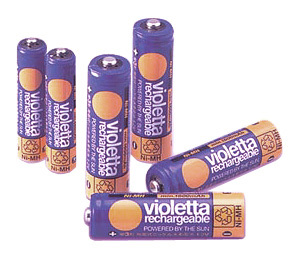 Economical and environmentally friendly batteries rechargeable by sunlight with Violetta Solargear VS01. Designed to stand high temperature and overcharging under sunlight. Last up to 1000 charge/discharge cycles. Ideal for high drain electrical appliances. Cycle life: Up to 1000 charge/discharge cycles.